Muhammad was 40 years old when Allah commanded him, through His angel, Gabriel, to declare and to deliver the message of Islam to humanity. "Read in the name of thy lord and cherisher who created: Created man out of a clot of congealed blood. Read!And thy lord is most bountiful, He who taught the use of pen; Taught man that which he knew not". These five verses were the earliest revelation, and they came to Muhammad on the Night of Power or the Blessed Night in the month of Ramadhan in the 40th year of the Elephant. Contrary to popular belief, Muhammad had no hesitation in accepting the mission of prophethood nor he had any difficulty in repeating the verses of the First Revelation. Gabriel, in fact, was no stranger to him, and he also knew before hand the mission imposed upon him by Allah, this was only a signal to begin. Also, Gabriel didn't have to apply physical pressure on Muhammad to read. Further Muhammad Mustafa did not contemplate suicide at any time in his life. Nevertheless, Muhammad realized that in the execution of his duty, he would be confronted by the massive, formidable and determined opposition of the pagans of the whole world. He was, therefore, in a somber frame of mind as he returned home & wrapped up himself in a blanket. When Khadija heard the story that Muhammad told her, she comforted him and reassured him that Allah will never forsake him. She reassured him and convinced him that with Allah's Hand on his shoulder, he would rise equal to his duties and would overcome all obstacles. This was the signal to Muhammad to begin his work. That evening Muhammad returned home conscious and conscientious of his new duty that he had to preach Islam, and that he had to begin from his own home – by preaching it to his wife and she readily accepted Islam. She was the first Muslima. 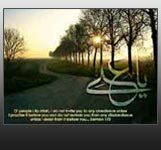 Since Ali was a member of the Prophet's own family, he was inevitably the first, among males, to receive the message of Islam. In fact, Ali and Qur’an grew up together as twins in the house of Muhammad and Khadija-tul-Kubra. Later Abu Bakr accepted Islam. In the beginning, Muhammad preached Islam secretly for fear of arousing the hostility of the idolaters. He invited only those people to Islam who were known to him personally. Then Uthman bin Affan, a future khalifa of the Muslims; Talha, Zubayr, Abdur Rahman bin Auf, Saad bin Abi Waqqas, and Obaidullah ibn al-Jarrah converted to Islam. For a long time the Muslims were very few in number and they did not dare to say their prayers in public. Three years passed in this manner. Then in the fourth year, Muhammad was commanded by Allah to invite his own folks to Islam openly. Three years were silently employed in the conversion of fourteen proselytes, the first fruits of Muhammad's mission; but in the fourth year he resolved to impart to his family the light of divine truth, he prepared a banquet for the forty guests of the race of Hashim. ‘Friends and kinsmen,' Muhammad said to the assembly, ‘I offer you, and I alone can offer, the most precious gifts, the treasures of this world and of the world to come. Allah has commanded me to call you to His service. Who among you will support my burden? Who among you will be my companion and my vizir? No answer was returned, till the silence of astonishment and doubt, and contempt was at length broken by the impatient courage of Ali, a youth in the fourteenth year of his age. ‘O Prophet,' he said, ‘I am the man. Whosoever rises against thee, I will dash out his teeth, tear out his eyes, break his legs, rip up his belly. O Prophet, I will be thy vizir over them.' Mohammed accepted his offer with transport, and Abu Talib was ironically exhorted to respect the superior dignity of his son. This banquet at which Muhammad, the Messenger of Allah, declared Ali to be his successor, is famous in history as the banquet of Dhul-Asheera. It is reported that some days after the second banquet of Dhul-Asheera, Muhammad climbed up the hill of Safa near Kaaba, and called out to Meccans & said: "Will you believe me if I were to tell you that an army was hidden behind yonder hills, and was watching you to attack you as soon as it found you off-guard?" They said they would believe him because they had never heard him tell a lie. Then he said "The Lord of the Heavens and earth has commanded me to warn you of the dreadful time that is coming. But if you pay heed, you can save yourselves from perdition..." Then Abu Lahab, who was present among the listeners, interrupted him again by saying: "Death to you. Did you waste our time to tell us only this? We do not want to hear you. Do not call us again." Thenceforth Abu Lahab made it a practice to shadow the Prophet wherever the latter went. If he started to read the Qur’an or to say something else, he (Abu Lahab) interrupted him or started heckling him. Abu Lahab's hatred of Muhammad and Islam was shared by his wife, Umm Jameel. Both of them were the recipients of the curse of Allah in Al-Qur’an al-Majid (chapter 111).